One of the things about Hattie, (we rarely called her Harriet) was that she had a ritual of staring out of the window every morning, which we attributed to her ‘checking outside was still there’. It turned out we were right. When we moved house the first thing she did in the morning was look out of the window, and she screamed, and ran to the other window and screamed again. Completely unconcerned at being in a new house, she was horrified that Outside had Changed! It took several days before she recovered. The demise of Zappa and the move to neutral territory did something to improve relations between Hattie and Morph but they never became friends. Morph, despite his laid back adoration of his humans rather despised Hattie’s despot tendencies and she knew herself to be queen empress and thought him beneath contempt. It wasn’t a peaceful home, we had the bottom half of a house, with massive basement, on the corner of a very busy road. I feared for the cats, but they had no interest in going near the traffic, and the back garden at least had a high wall (until a drunk drove into it). We had to make the garden from scratch and Hattie would come and help. Morph would sit on a windowsill and gaze at us in horror. Hattie disappeared several times while we lived there – she was adventurous and was gone for three days in heavy snow, and two one summer – that time she came home with no voice and a wound to her neck and throat – a very close call that kept her home for a long time. Hattie adored visitors, and was especially fond of our friend C who would move in while we were on holiday, and once spent Christmas with us – Hattie was surprised and delighted to wake Christmas morning and find us and C there, and I heard her holding a lengthy conversation with C on the way to her breakfast, using a vocabulary of chirrups and murrips she never used to us – I can’t help wondering what she had on her mind. such closets to ransack such arbours to importune. Never tracked down where it’s from but I’m guessing a Jacobean revenger tragedy by Myddleton or someone. Morph’s nerves caused him to hide a lot and he spent part of every day under the covers in my bed, lying as flat as he could… he got sat on regularly. As he was double jointed he could get into the tiniest spaces, he once spent a week behind the built in fridge, eventually coming out for a peice of stilton – he loved smelly cheese. Eventually we could stand the strain of living in this house, lovely though it was, no better than Morph, and owing to a death in the family inherited enough money for a deposit and moved swiftly to our beloved current home, a mid terrace 1920’s house in a quiet street with a middling sized garden backing onto a railway cutting. The cats thought they had died and gone to heaven; Hattie regularly went peacefully to sleep in the middle of the lawn. (I say lawn – patch of grass would be more accurate). 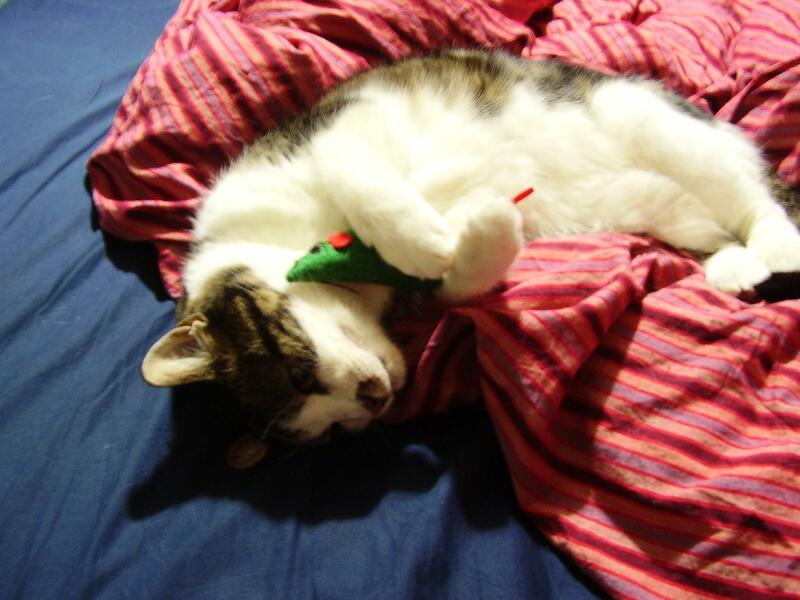 Harriet was a mighty hunter, and brought us in daily mice, birds and rats. In the first week we et her out she killed three enormous rats, too big to get through the catflap. 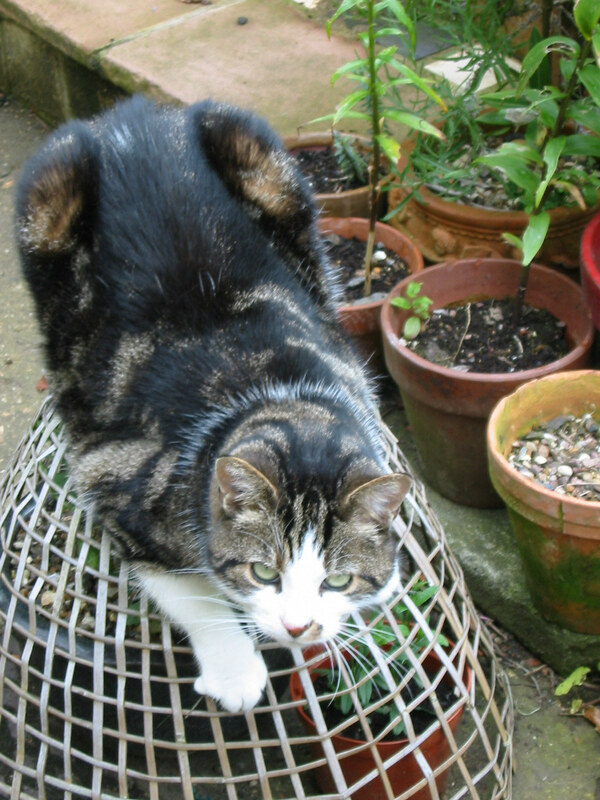 We once saw her sitting apparently completely relaxed beneath the bird feeder, then as a sparrow landed, she leapt up vertically, smacked it and landed, with the bird dead of a broken neck at her feet. Surgical strike by Harriet Jump Jet. We gave her a round of applause, then moved the feeder higher. She bounced up and down under it for a few days before admitting defeat. Morph only ever caught one mouse, it was the smallest thing I ever saw – about the size of the first joint of my thumb. We reckoned Morph must have been sleeping with his mouth open and the mouse ran in mistaking it for its hole… Morph was very proud of himself. Not long after we moved, we were joined by a third cat and completed this particular dynasty. Madge (Her Majesty Magdalena Montmorency Mountjoy) was found up a tree during a rain storm in the garden next to where I was working. The guy living there was up a ladder trying to persuade her down as I arrived for work. I offered assistance and between us we got her to ground level, at which point she ran in hysterical circles shrieking, and running up and down the fire escape. I managed to gather her up, and as she did not resist, took her into the office, dried her with paper towels, fed her milk and dropped her in my pending tray where she went to sleep. By lunchtime the rain had stopped and I let her out to see if she remembered her way home. She started the circling and screeching routine again, so I left her in charge of my desk and went home for some cat food. She ate happily and went back to sleep, this time less conveniently in my in tray. At the end of the day, I tried again to convince her to find her way home, without any joy. So I plonked her in the back of the car, and drove home, with a friend’s story of their cat getting loose in the car and sitting on the driver’s head with paws over her eyes, at the forefront of my mind. I needn’t have worried, Madge perched herself and peered inquisitively out the windows, and let me gather her up without any concern when we arrived home. Explaining to A that we had a visitor, I shut Madge in my room with food and a litter tray. We weren’t planning on her staying, I was sure she had a home, close to the office and I just needed to put up notices. We developed a theory that Madge had tripped up her old lady once too often, and left home in a huff when the staff stopped working for her. At any rate she worked out how to turn the door handle and came out to introduce herself to Hattie and Morph. Morph was thrilled, but Madge swore at him, and he never ever forgave her. In the end, no one claimed her, and for a month or so, every visitor who came over the doorstep had her virtues paraded as we tried to find her a home. we didnt think three cats and only two laps would work Then I noticed that this sunny animal was looking gloomier and gloomier and we decided we were being mean and should just adopt her. Morph wasn’t pleased, and Harriet refused to acknowledge her existence. We settled for an uneasy truce, with Madge very much knowing her place, and almost never getting lap. In fact on one occasion when she was having a cuddle, Morph came in, gave her a look and said ‘Keck‘, I don’t know what this means, but it clearly was not kind – Madge slunk away immediately and didn’t show her face for a couple of days. By this time Morph was getting quite old, and was loosing it a bit. We would be sitting in the living room and these terrible tragic wailings would be coming from the hall (King Lear, we called it) if we went out and checked Morph would immediately stop and make cheerful noises. Then one summer night we came back from dinner with a friend and went up the garden for some air with Morph toddling at our heels. I looked down, and said there’s something not right with this cat. He was swollen up like a balloon. we tossed a coin for who was going to risk their driving licence (we’d walked home, as we’d been drinking) and raced to the vet. It turned out that he had a tumor which had started bleeding, and there was nothing to be done. 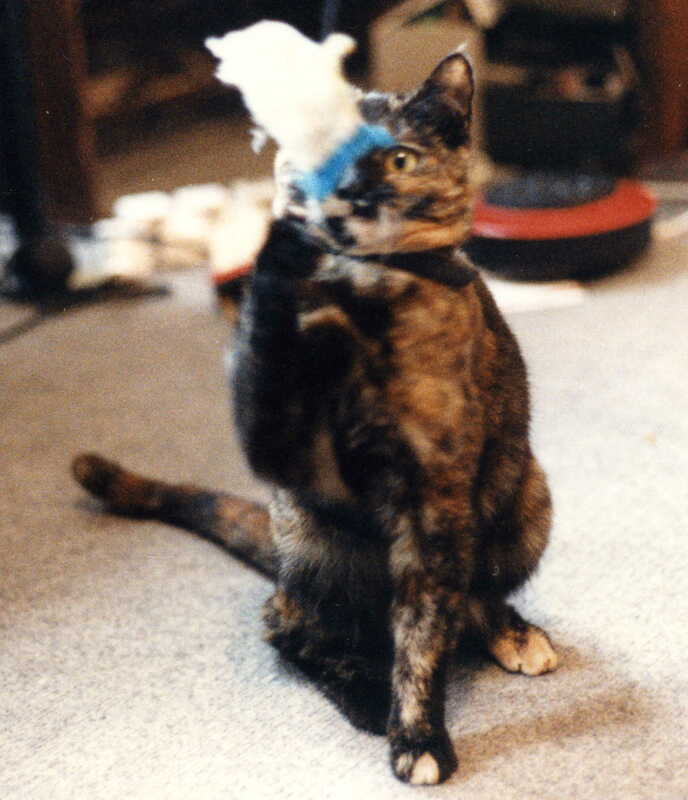 Harriet now ruled unopposed, and took up Morph’s wailing duties, and was just as cheerful if interrupted. She really was magnificent, this tiny scrap of a cat, ruling the entire street. No cat dared cross her path, they would cower away form even a look. She even kept the local foxes in order: she was asleep on the garden seat one day when the ancient dog fox woke her up by sniffing at her, she leapt up swearing and boxed his ears. Harriet didn’t last much longer than Morph, becoming increasingly fragile and her kidneys beginning to go; none the less, in her final hours, she chased a piece of cellophane around the hall, frightened a neighbouring cat into caniptions and received visitors graciously. That cat had style. Harriet’s death left Madge an only cat, and she could hardly believe her luck. She had always been a disgusting pig about food, taking vast bites and scraping what wouldn’t fit in her mouth off with her paws. She stopped doing this and we realised she had been golloping her food because if she didn’t Hattie took it off her. Not having to fight for her food she became quite ladylike. It took a long time to convince her she was allowed to be cuddled and no one was going to say Keck ever again. Sadly this late dawn was not to last. 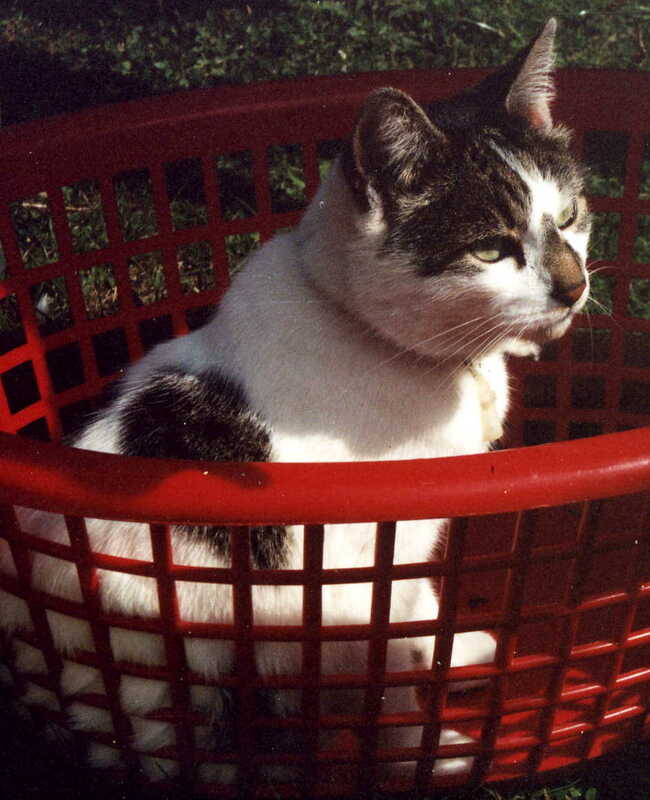 Aged only thirteen (Hattie and Morph had both made it to eighteen) she was diagnosed with lymphoma and went down hill very rapidly. I spent her final day hand feeding her kitten milk drop by drop off my fingers, which she thoroughly enjoyed, although every time I got up to go anywhere she tried to follow me. So for the first time since I was eighteen I had no cat. For three months I couldn’t bear the idea of another animal, but the house, although a great deal cleaner, felt very empty without a small furry body bundling up to the front door when I got home from work, so we soon started looking for a new feline family. But that’s another story. 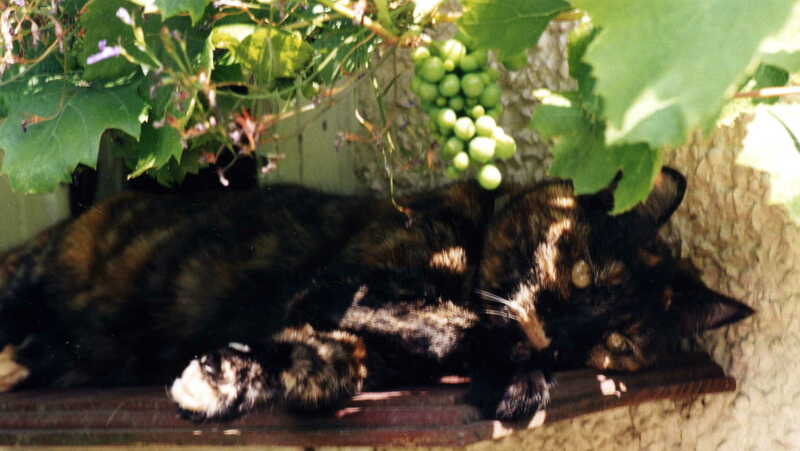 This entry was posted in Inspirations, memoir and tagged cats, Cherry Potts by Cherry Potts. Bookmark the permalink.